A Tanuki, also known as a raccoon dog. A Japanese office worker who found and adopted five newborn "cats" discovered the animals were actually Japanese raccoon dogs. 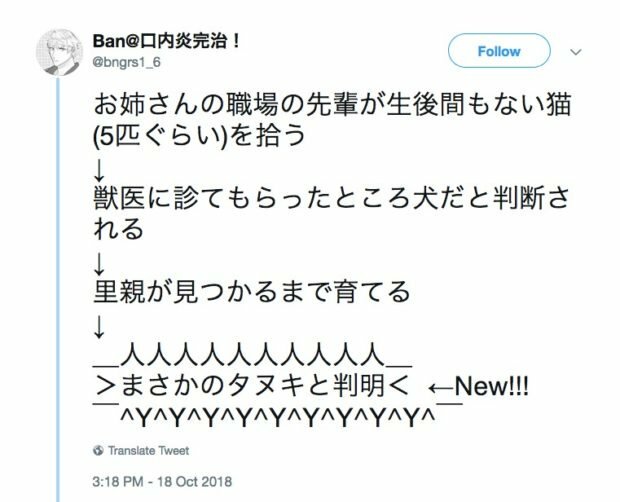 The story of this well-meaning animal lover came to be known through a tweet by "Ban" (@bngrs1_6) on Oct. 18. Ban wrote that her sister's officemate had taken in what looked like a litter of five kittens, as reported by SoraNews24. The officemate later brought the animals to a local veterinarian to have them checked out and confirm what they were. The office worker was surprised when the vet concluded the animals were actually dogs. With this thought in mind, the office worker decided to keep the animals until a foster home could be found. It was after the pups had gotten bigger that the office worker confirmed they were actually Japanese raccoon dogs or "tanuki." To be fair, the vet wasn't too far off the mark because tanuki are indeed related to dogs. Tanuki are unique because their appearance is a cross between foxes or wolves and dogs with raccoon-like markings. Even more so, tanuki pups look like kittens because of the small paws and large ears while emitting the kitten-like mew sound. In Japanese folklore, tanuki are said to have mystical shape-shifting powers, and are masters of disguise with a jolly and mischievous disposition. It's perhaps because of their physical characteristics that ancient Japanese thought of the tanuki in such a manner. Tanuki could actually be kept as pets with the proper permits, but the office worker decided to hand them over to a conservation centre for better care.